Combine ¾ cup soy sauce, ¼ cup sesame oil, 1 garlic clove and ginger for marinade. Set aside ¼ cup of marinade for basting. Place tenderloin and remaining marinade in quart-size Glad® Food Storage Bag, and marinate in refrigerator for 2 hours*. Light grill using Kingsford® charcoal. Remove tenderloin from refrigerator and discard marinade. Grill tenderloin on covered grill over medium heat, turning occasionally to prevent burning, about 15–20 minutes, or until cooked through. Baste with reserved marinade the last 5 minutes of grilling. Combine barbecue sauce, remaining soy sauce, sesame oil and garlic in a small pan and heat on the stove over medium heat until it begins to boil, about 4 minutes. Remove from heat and set aside. 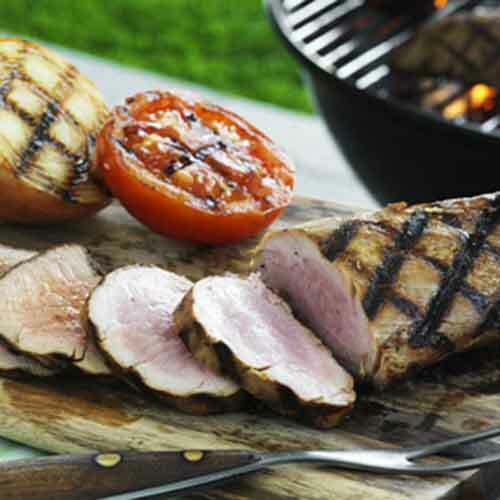 Remove tenderloin from grill and let cool for 5–10 minutes. Slice diagonally and drizzle with warm barbecue sauce mixture. *If time allows, marinating overnight is suggested.